Government assistance like food stamps does NOT subsidize businesses. So a #UBI wouldn’t cost anything or at least less. It would just shift from in-kind benefits (with all the associated overhead) to cash. Wal-mart is paying market level salaries. Would it be better that Wal-mart not hire and the state picks up the entire amount? Uncle Sam already subsidizes wages. Look at Wal-mart. Most employees get food stamps and government insurance. I forgot to add that since we are now providing a “subsidy” to every American citizen, there is no reason to subsidize businesses. While businesses should also face the same flat tax, there would have to be many changes to the way profit is calculated. Let’s get the tax code for individuals straightened out first. There are many efficiencies to be gained to changes to the corporate tax code. Looking at a UBI in isolation makes the idea seem like a give away. Better to think of it as a change in the tax code. First start with a flat tax on all income, no standard deduction. You could cut the 8 billion man-hours to at least 4, and companies could file accurately for their employees. No tax filing for employees! That’s the equivalent of adding 2 million productive people to the labor force, at least 1% bump to growth in GDP. Now how much? No one wants a citizen to live in poverty, so the federal UBI could be set at 100% of the poverty line. Current state and federal is often set at 200%. My state of MA currently provides $50,000 in in-kind benefits to a single woman with two kids, but by the time she makes $60,000 and pays taxes, it’s all gone, for an effective tax rate of 100%. Ludicrous! Beyond 100%, states and charities could do as they wished, incentives be damned (joke, but really not funny), based on their liberal bias or state cost of living or whatever. What happens if the federal government provides 100%? No more federal welfare. Care above 100% is left to the states. Some 700,000 welfare workers and some IRS move to the private sector. For a total of ~1 million workers (this is one way to get “smaller government”) or an additional 2/3% GDP growth. (I grant you that these workers may not be productive for quite a while.) Other federal safety-net programs will be reduced dollar for dollar. Disincentives will begin to disappear. What is the cost? For those on benefits, $0.9T (of $2.0T) safety-net reduction for $0.9T UBI. For net tax payers, $0.8T is paid back to the tax-payer for no net cost, however their marginal rate has been reduced. The remaining $0.6T cost (based on $10k/adult and $2k per child) goes to those who are partial payers, while this portion is paid for by the reduction in all tax deductions (from the rich) it will really be paid for by the 1 2/3% growth in GDP, which will go to all income producers, but primarily the rich. Legal immigrants will get a tax rebate up to the UBI amount. US is still land of opportunity, but no longer the land of the hand-out. We fix the tax code and get rid of welfare. What is that worth? Redistributing Income… Government once again choosing winners and losers..
PS,, their is plenty of labor just south of the border willing to work for a pittance,, at least that what the main stream media tell us..!!!! f4j7, Mitchell has already shown you are completely wrong; he has a chart showing that all quintiles rise and fall together. If you search that chart out, it will put your mind at ease. The best way to help the bottom fifth of the economy is to help everyone grow, meaning, get the government out of the way. That is factually false. Inflation-adjusted incomes HAVE grown since 1970. See my post below. All figures there are adjusted for inflation. Wages might have doubled since 1970, but the purchasing power of the dollar since that time has been cut in half! No real progress in household incomes over that period of time. @jdgalt, I believe the EITC taper is equal to a 21 percent marginal tax rate. That’s in addition to payroll taxes of 15.3 percent and whatever federal, state, and local income taxes that may apply. If that’s gradual, I’d hate to see abrupt. Point 4 is exactly why Milton Friedman proposed the EITC to Reagan. Many existing welfare programs cut off eligibility sharply at a specific amount of income, thus creating a large marginal penalty for earning the dollar that puts the worker over the limit. 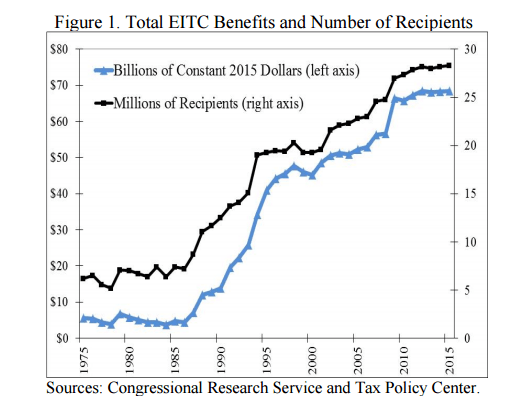 The EITC avoids that problem by tapering off gradually as his earnings increase, so that his total income continues to increase as he works more.